Yet another Canadian city — Saskatoon, SK — is poised to adopt a road safety program that aims to eliminate death and serious injury on its streets. 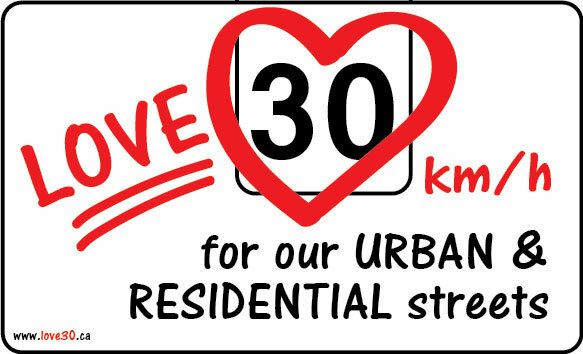 The city’s draft Vision Zero proposal is a welcome move that has garnered letters of support from the chief of police, the Saskatchewan Health Authority, Greater Saskatoon Catholic Schools and Medavie Health Services West. As it stands the proposal is a a mixed bag, so this seems like a good time to take a close look, and to draw some lessons for the benefit of Saskatoon and other communities poised to take the Vision Zero leap. First, a little background. Yesterday I was approached by the Saskatoon Star Phoenix, and quoted as expressing my concern that no Canadian city was really grasping what I call the Vision Zero difference: namely, the shift away from the deeply-ingrained shared responsibility road safety paradigm, and towards a “safe systems” approach. Too grumpy? Headline in the Saskatoon StarPhoenix, 11 Sept 2018. The StarPhoenix report provides a fair account of some of what I said. In the chat with Tank I was also careful to emphasize that the Saskatoon Transportation Committee and its partners are to be commended for their determination to eliminate traffic death and serious injury, and that a data-driven “safe systems” approach is perfectly achievable in any city. I also championed positive developments in other Canadian cities, such as Vancouver’s policy of prioritizing active and mass transit, or the superb #BuildtheVisionTO action items, recently proposed by a consortium of Toronto advocates. Towards the end of our chat I asked Tank where I could obtain a copy of the city’s Vision Zero proposal. He directed me to the document that you can access in PDF form here (pp. 17-33). Vision Zero is a strategy to eliminate all transportation-related deaths and severe injuries, while increasing safe, healthy, equitable mobility for all road users. It was first implemented in Sweden in 1997 and is gaining momentum worldwide. 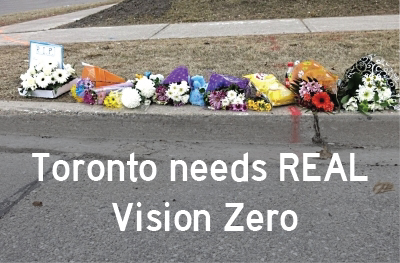 Vision Zero recognizes that traffic deaths are preventable. This is a fundamental change in the way people think about the transportation network and system. Vision Zero uses a safe systems approach for road design to reduce conflict points and the severity of collisions when they do occur. This is as sophisticated and timely a definition of Vision Zero as you will find anywhere. The emphasis on the “fundamental change” in the direction of “safe systems” really gets to the heart of Vision Zero. The goal of “increasing safe, healthy, equitable mobility for all road users” is also very important insofar as it recognizes active mobility and mass transit as public goods, and as essential components of a sound, safety-minded transportation policy. It has been less than a year since the Swedish federal government — who cut the country’s road deaths in half since the launch of their Vision Zero in 1997 — added the promotion of active mobility to their policy with the Moving Beyond Zero program. The next section of the Saskatoon proposal is only partially in line with Vision Zero thinking, which is why I’m crossing out a couple of lines in the following transcription. That last part (which can also be stated in one sentence, as above) is indeed an essential tenet of the safe systems approach. Vision Zero is fundamentally about building failsafe systems that mitigate harm even when road users are not “focused on safety.” As such, the Vision Zero / “safe systems” approach is, by definition, not a “shared responsibility” contingent on the good behaviour of road users. Between 2007 and 2016, 69 people have been killed and 12,666 people have been injured on Saskatoon roads. To address this significant level of injury and death, safety must become a priority over speed and convenience in both the design and operation of Saskatoon’s roads, the configuration of work zones and all the ancillary civic functions that impact all road users. Nothing to cross out here. Note the focus on data, and the continuing reminder that Vision Zero is about reducing significant injury as well as death. Note also the insistence that safety must come before the dreaded “Level of Service” (maximization of motor vehicle throughput) that came to be the primary concern of too many 20th transportation policies. Ironically, one of legacy of that cars-first planning is the increased congestion stemming from over-dependence on space-consuming private motor vehicles. Not to mention the resultant carnage and pollution. Now we’re getting into the weeds. The main problem is not that the last “E” begins with L. It’s that the proliferation of E-words is built on a very shaky, century-old foundation leading to scattershot “shared responsibility” programming that is largely antithetical to the “safe systems” approach. REAL #VISIONZERO (#safesystems) means appropriate levels of INVESTMENT in TRAFFIC CALMING, MODAL SEGREGATION and VEHICLE REGULATION sez @neilarason. This is not the place to rehearse the whole Vision Zero Difference. Suffice it to say that the doctrine of shared responsibility (onus on all) and the doctrine of safe systems (onus on the bureaucrats and system designers) are radically divergent. This means that one cannot bridge the gap between them by adding more components. If anything that just complicates matters, making it harder to focus. To put it another way, Vision Zero is largely a matter of refraining from doing certain things — such as wagging one’s finger off — because that approach sloughs responsibility away from the system designers and onto the individual road users. True Vision Zero policy questions the legitimacy of defensive walking and defensive cycling campaigns. So get ready for some pushback from traditional safety experts. The rest of the Saskatoon proposal reiterates the points listed above in various ways, liberally quoting material from across Canada and beyond. In many respects the draft is remarkably sophisticated, but it strays from the proven “safe systems” ethos whenever it slips into talk of shared responsibility” or starts piling up E’s. For more information I invite you to explore this web site and Twitter feed. NEW POST on #Saskatoon's draft #VisionZero proposal. This entry was posted in road safety, safe systems, Saskatoon, Vision Zero on September 12, 2018 by grahamlarkin.